Nancy White is a keynote speaker and an international practitioner in understanding and practicing online and face to face group facilitation. She founded Full Circle associates in 1997. She focuses on online and offline strategies with a passionate interest in community and collaboration and among the services she provides are facilitation, strategic planning, trainings and online community building services. We started this interview by letting Nancy speak about her work. Nancy White: It’s difficult to put it in one line, but if I had to, it would be: “Helping people get things done”. You see, there is the fundamental element of social learning in almost everything we do. As we get things done together, we learn with and from each other because we are social beings. We have to understand this in the context of our organizational and professional surroundings. The services I provided over the years have changed. At the beginning, I had the opportunity to be involved in the early lives of online communities. I was part of a successful community that started to fail spectacularly because it lost its funding and I really wanted to know why it failed socially. So my passion became understanding what was the same and what was different about how we interact online vs offline. There is a difference between the online and the offline environment because it creates different patterns, and yet the underlying human behaviors are pretty darn consistent. TallyFox: Can you tell us more about your work on distributed work teams? Nancy White: My practice expanded to include all kinds of social learning online and offline and learning distributed work teams was a big piece of that. I work a lot in the international development context where people come from different organizations and they have to work together on a project and at a distance. It has been said that face-to-face is the ultimate and the only real way to work together, but what if we don’t have that privilege? Should we deny people that experience just because they don't have the privilege of having money or influence or resources to travel? No! When I was invited to speak in 2002 in the Hague I found myself among the people who were talking about knowledge databases and I was talking about sharing knowledge in a way that doesn't keep us from doing our work but allows us to learn from each other because, to me, that was how change and advancement happened. Everybody was jamming information in databases which nobody was using because people don't go looking at databases. We're not habituated to search; we're habituated to ask. We're habituated to test and experiment, not to follow a precise plan, and all our systems were contrary to the types of solutions we needed. This is not about people who need to fix a widget the same way every time, I'm talking about people who must figure things out, just like Tally Fox is figuring out what are the solutions that people need, and how can our solutions support them in lots of different contexts. It's a tough nut to crack. TallyFox: This is how you became a part of the KM World? Nancy White: Yes, at the time there was a movement towards knowledge sharing in international development. It spoke about participatory methods which enable people to collect and make sense of their own data, rather than some expert coming in from the outside. The question is: “How do we connect this at every level of the system because you need the bosses and the funders but you need the frontline as well, and they all have to play a role in collecting the data, making sense of the data and using the data for learning.” There is a human interface between each part of the system, be it mechanical or natural or technological. To me that's the Nexus of knowledge and I don't think it can always necessarily be managed in the classical sense. We must create conditions for it to happen. There are many theories and frameworks to do that and that's where my practice is focused. TallyFox: Would it be safe to say that your trainings and workshops are all about conversation and the knowledge that comes out from that conversation? Nancy White: I would alter that a bit. The trainings are about how we use conversation and other tools to get things done, and conversation is a tool. And I know we’ve been successful if people are accomplishing the things they want to accomplish. TallyFox: What are the frequent problems that the companies are looking to solve with your workshops? Nancy White: “How to work in a complex environment“ is probably number one. I'm working more and more now with people domestically, in the United States, and with recent political changes people in the nonprofit sector many may lose their funding base, or the requirements for their services may triple or quadruple so they have to plan to be ready for a different reality. People sometimes aren't clear about their goal. The amazing people in the international development and the nonprofit sector, who set a clear vision are not particularly adept to strategy and if you're not paying attention to strategy you're also not paying attention to current conditions and how to adapt. People are often looking for an instant solution and the types of workshops and trainings that I'm running for people are about building capacity and practicing, not about showing up, learning something and expect it all to be solved. The real emphasis is on practice, i.e. participating. I work a great deal with individuals, rather than organizations. Individuals carry the change. Organisations are too slow. Organizations want solutions, which is absolutely legitimate, but they aren't so good at supporting the practice to get to the solutions because they're too busy focusing on the solutions. TallyFox: That’s an interesting point. I suppose trainings are always a two-way process. What do you receive as feedback? Nancy White: I have to confess, I'm one of those people who think by talking. I don’t just sit there by myself, ponder the universe and offer up my solution. It really begins when I decide to share what I've been thinking and practicing and then I realise how much I’ve learned. I'm totally comfortable with role modelling learning through imperfection and approximating towards a goal. So every workshop I do is a learning opportunity for me. Someone else could offer an insight that could change your practice, and for me and that's the joy in the work - the joy in discovering the synergies. There's a certain set of real redesign called learning that's powerful. The second piece of it is that people tend to cling to the insights that they came about on their own. Until you have somehow discovered for yourself how a certain useful practice is or isn't true you're not going to own it. So it may entail a bit of “wheel reinvention” – another form of learning! TallyFox: Is there such a thing as “best practice” because it implies just one model that should be implemented everywhere? Nancy White: In very simple things, yes, absolutely. The mistake is assuming that best practices work in the domains of complexity. “Best practice” sounds good, it reassures people. I work a lot with the role of gender in International Agricultural Development which is a complicated issue. Until recently there weren't many ways to measure and understand impact. The easy thing to do was simply collect gender-disaggregated data collection and if you did that, you “checked the box” for best practice. But the questions we have to ask are “How did you make sense of that data? How did you use it?” A best practice isn’t there by itself. It has to be situated within the context. I work in a lot of large UN organizations where the size of the bureaucracy starts requesting best practices rather than the best way of working. To that I say: “People can learn and apply their learning, own the data and the sense making. It can really change how they work, but often they are not given the conditions, or the permission, sometimes they're even forbidden to operate that way.”. You can say that's probably a form of knowledge management, the way managers create the conditions for people to productively work in complex settings. TallyFox: Can you tell us more about your work with geographically dispersed teams? Nancy White: There's an interesting parallel that happened when I was working with e-learning and with distributed teams and upon reflection I would single out two aspects of the teacher-student relationship: “If people understand enough about each other they listen to each other differently” and “We have to build up our collective capacity to be able to observe”. There's a liberating structure called: What? So what? Now what? which I use a lot, both face-to-face and online. With “What?” we ask for observations, they can go from hard data to if people looked comfortable. People I’m training for the first time tend to state the obvious, but I make them go back and truly observe. And then, before we move to the second question, I’ll add: “In a busy world, we tend to turn down our observational powers and focus on our preparation for our next step or word. When you come back to your observational skills you begin to listen better, pick up nonverbal cues, even in the online world. Sometimes you need to filter things out because you're moving fast and sometimes you need to go down the ladder of inference and go back to the data, before you make assumptions and jump to their conclusion. TallyFox: The second question would be “So What?”. Nancy White: Yes. Sometimes we discover we've been doing things that don't matter and we need to stop doing them if we want to make time for sharing knowledge. 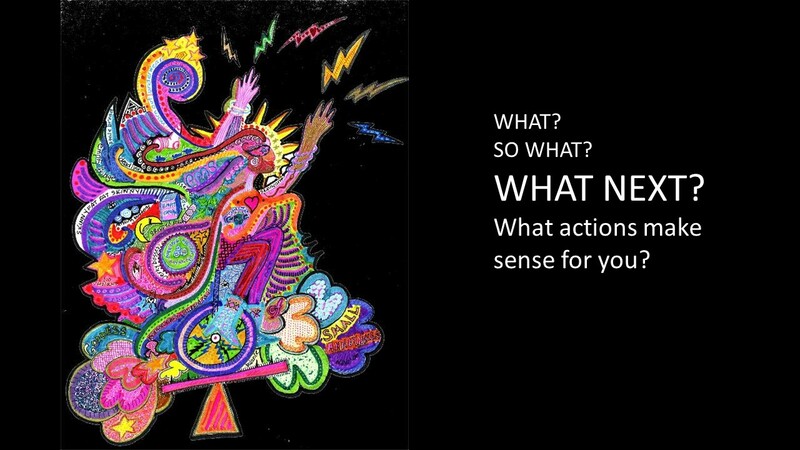 The question “So What?” helps us understand why it matters. One of the key liberating moments is when you discover what to stop doing. TallyFox: The third question would be “Now What?”. 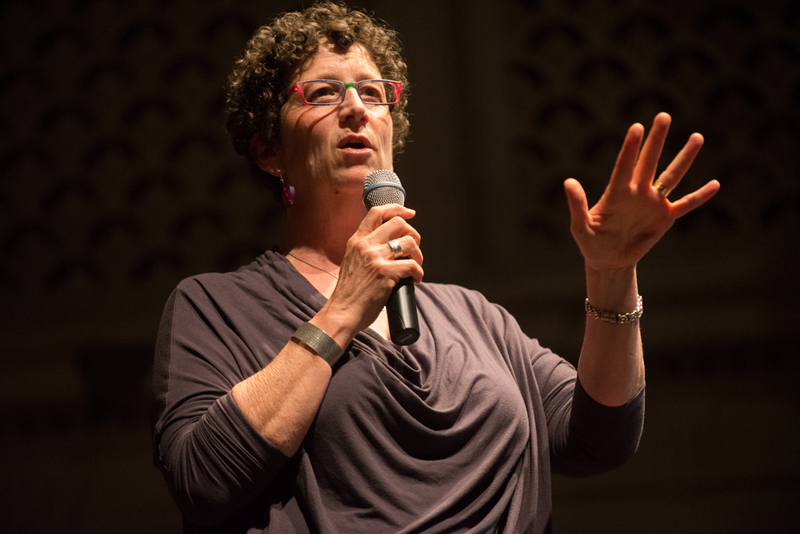 Nancy White: The third question, “Now what?” helps you move what you’ve learned towards the purpose of your work. When you constantly go through that whole cycle of observation, making sense of the data and deciding what to do about it, you're moving things forward. A set of rules can be helpful, constraints can be really helpful but you still have to focus on what matters and in all the work over the years on distributed teams being able to fill that cycle of observation, making an action embedded in a place where we know at least something about each other so that we can relate to each other as human beings. TallyFox: Your client list is quite impressive and I wanted to ask if you could share one of the stories that could show our readers something new about the way you work? 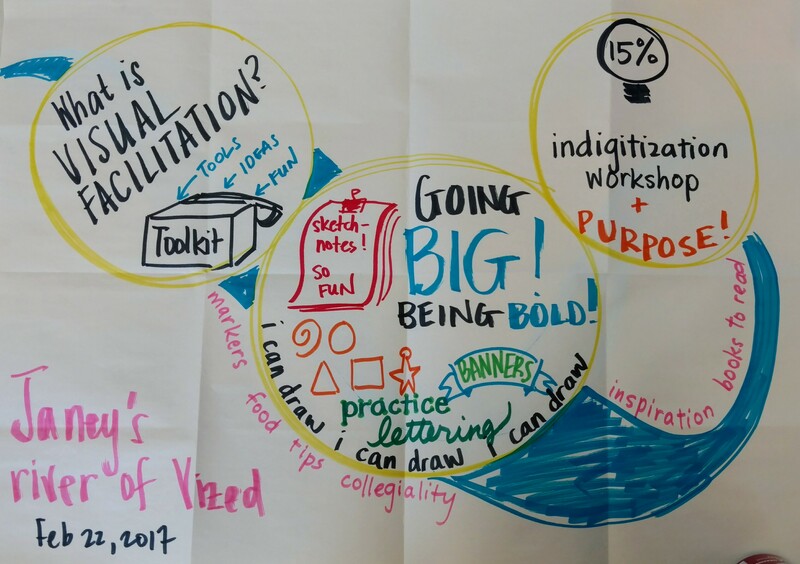 Nancy White: There are a couple of blog posts on my blog (here and here) on clients who were willing to let me share their stories about strategies of using complexity and form methods to help groups figure out the goal of their work and the process. That's been my leading learning edge for the last four years. There’s a story about how we use a complexity lens for planning. Traditionally, strategic planning is a step by step process: you establish the goal and then log frame. 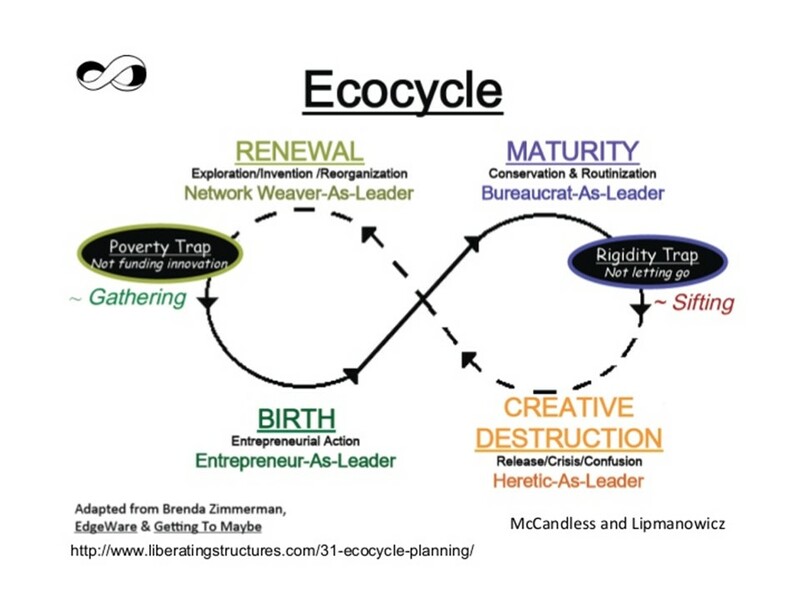 What I advise is that instead focusing on the log frame view, you first look at your practices in an eco Ecocycle view, which perceives everything to be in the cycle that includes creative destruction, making space for innovation and the birthing of the new and putting that into maturity. At one end of that Ecocycle, there's the rigidity trap that prevents us from not getting rid of, or changing the stuff that's not useful anymore. This sits just past “Maturity.” On the other side is the poverty trap which is where we believe we can’t afford to change. Strategic planning in complex contexts asks for new talents to come forward. I’m always asking, how do I nurture enough creative heretics in the organization to help us spot what we should stop doing. How do I find places for those creative networkers who are always looking outward and bringing in new ideas like a fresh wind blowing new seeds to increase the diversity in a field of wildflowers, and who are the people who can take an idea and make it into reality and test it, iterate it, and bring it back into that space of maturity. A manager breathes easier when they understand that they're supporting a full Ecocycle, rather than simply focusing on the maturity area where they're typically asked to focus. (And where they are most often measured!) Then we put it all into context. There are critical uncertainties we need to consider as we need to prepare for whatever happens. We can have both robust, resilient and antifragile strategies in times of uncertainty and complexity. The other piece of the learning puzzle is a visual piece. Visuals help us open up our conversations making them initially less “certain” and thus more negotiable than a declarative statement. During this process, you actually hear each other in a deeper and more significant way. This is why I always have a visual element to make sure the “So What?” really happens, but it also helps with the “What Now?” and the observation of data. TallyFox: What are you working on at the moment? Nancy White: I’m working on an article about the role of community network mapping in complex international projects. It's a way to make sense of a very dense set of things and look for patterns that you couldn't see if you looked at a column of numbers, or tried to hear everybody present something at a conference. I've been working with Aldo De Moor, from Community Sense in the Netherlands and Andrea Bohn from the University of Illinois on a project which supports our hunch that visual of mapping helps people make sense of their practice in different ways. All of the work has practice elements, a lot of it from Liberating Structures. 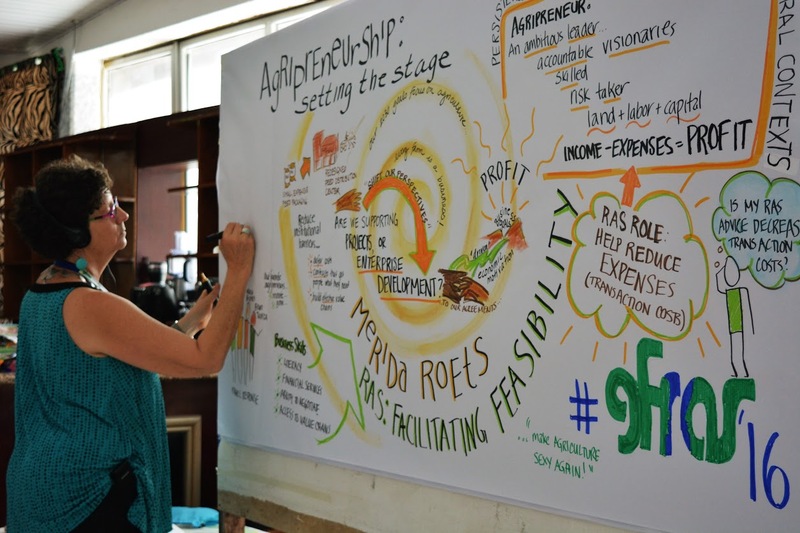 This way of providing processes with just enough constraints and openness, rapidly cycle people through the work to get the it done, to adequately ground it in complexity science and using visual anchors to both stimulate the conversation and to capture and understand it has been transformative. TallyFox: Why do you think they respond well to what you teach them? Nancy White: I come in as a fellow practitioner. I share what I know. They share what they know, but I also share the processes and instructions so they can execute them. The first time, it may be a bit bumpy, but that's okay because that’s a learning opportunity. When they're actually walking the talk, living the values that they want to live as they imperfectly move towards a better way of doing things, that’s when I know I’ve succeeded. We thanked Nancy for this very insightful interview and we invite you to read her blog, always full of fresh insights.